Trekking with meditation in power spots. 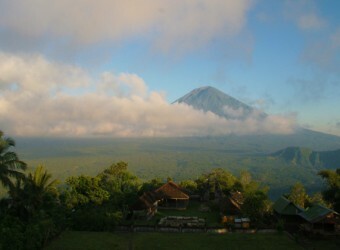 Activity Bali Club which offers various eco tours is now offering a trekking tour including meditation. Rump Young Templs on the top of Mt. Rump Young as known as a spiritual power spot takes 3hours by car from the resort area. The elevation is about 1,000m and you can get to the top about 1 hour and a half trekking! Be active both physically and mentally! It is not famous as a sightseeing spot, but known as the head temple of a Balinese Hindu sect same as Besakih Temple. "Rump = Light" and "Young = The Greatest God of Bali Hindu. Balinese people visit the temple when accidents keep happening to pray under the light of the greatest god which cleans up both mind and body. * We will let you know the exact time in the booking. * The transportation is by Bali Club and they go around the hotel in each area, so the time might be back and forth. ・The pick-up time might be back and forth or you might share the car with other guests. 9：15 Arriving at the start point and the trekking starts.